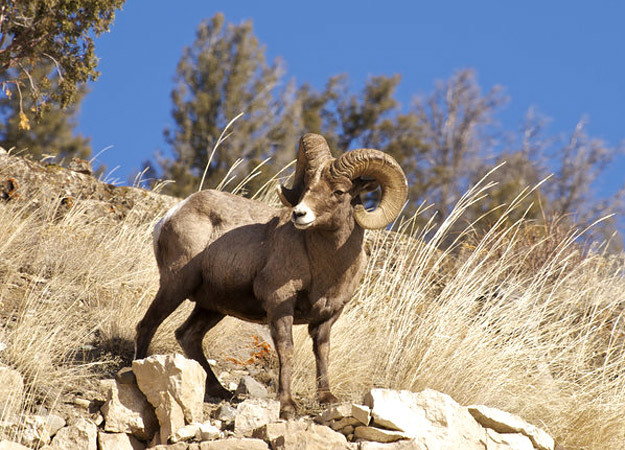 The bighorn sheep can be found across the mountain ranges from Canada to Mexico. Their huge curved horns weigh up to thirty pounds (14 kg) and when the mating season arrives in the fall, the rams, charged with testosterone, fight to find a champion who will claim a group of females. The males rear up on their hind legs and launch themselves at one another, charging at twenty miles an hour (32 kph). The clash of their horns can be heard echoing through the mountains. They will repeat the confrontation again and again, sometimes for hours, until one ram submits and walks away. Luckily their bony skulls usually prevent serious injury.